Bob Marley ag seinm ar 30 Bealtaine, 1980. Nina Mile, Saint Ann Parish, Iamáice. 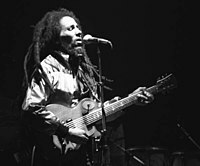 Ba cheoltóir reggae as Iamáice é Bob Marley (6 Feabhra, 1945 - 11 Bealtaine, 1981). Amhránaí, cumadóir, giotáraí agus gníomhaí polaitíochta a bhí ann. Thosaigh Marley ag ceol i 1963 leis an ngrúpa ceol The Wailers agus bhain sé stíl shainiúil cumadóireachta agus gutha amach. Scaoil The Wailers roinnt de na céad ceirníní reggae leis an léiritheoir Lee "Scratch" Perry. Scoir The Wailers i 1974 agus chuaigh Marley chun cónaithe i Sasana, áit a thosaigh sé ag ceol ina aonar. Scaoil sé albam Exodus i 1977. D'éirigh go maith leis an albam ar fud an domhain. I 1978 scaoil sé an albam Kaya, agus bhí na singil "Is This Love" agus "Satisfy My Mind" ar an albam. Ar an 3 Nollaig 1976, rinneadh iarracht Marley a fheallmharú ina theach féin. Bhí Marley gortaithe. Thacaigh sé rialtas Iamáice agus a phríomh-aire Manley. Cúrsaí polaitíochta, go príomha, ba bhun leis an ionsaí is cosúil, i gcomhthéacs na géarchéime polaitiúla ag an am. Diagnóisíodh go raibh meileanóma urchóideach air sa bhliain 1977. Ba Rastafárach díograiseach é agus chuir sé spioradáltacht ina cheol go minic. Ag an am céanna, ní raibh Marley sásta leanúint leis an gcóir leighis, ar chúiseanna creidimh go háirithe. Fuair Marley bás ar an 11 Bealtaine 1981 i Miami agus é 36 bliain d'aois. Tugadh an leathanach seo cothrom le dáta an 4 Márta 2019 ag 17:21.